Kenyalogy is a non-official travel guide to Kenya. It is not affiliated to anything or anyone. All the info and facts are to my best knowledge and understanding and the opinions reflected here are only mine. Kenyalogy is mostly a one-man band. This is me, Javier Yanes. I was born in Madrid, Spain. I earned my PhD in Biology and then turned to writing. I completed a master degree in journalism and have worked in several travel magazines in Spain, and as a freelance reporter for some other publications. During five years I worked at the science section of a daily national newspaper in Spain. I also write fiction. My novels "El señor de las llanuras" (2009), "Si nunca llego a despertar" (2011), and "Tulipanes de Marte" (2014) were published in Spain by Plaza & Janés (Penguin Random House) and translated to several languages (unfortunately no English translations yet). I have travelled almost since I can remember, and in 1992 I travelled to Kenya for the first time. In 2000 I published the first version of Kenyalogy. Since I (usually) have other sources of income, Kenyalogy has never been really managed as a business, which allows me to keep my independence and be selective with my contents and links. CAN YOU RECOMMEND A TRAVEL AGENT OR SAFARI OPERATOR IN KENYA? NO. Please don't ask. This website is all about tailoring your own safari, but alternatively you can choose one out of the many companies that will be willing to accept your money. I do not use any companies/agents/operators nor do I sponsor any of them (unless they do sponsor me, and in this case it will be clearly shown). I love animals. Can you find me a job in Kenya? Do you own or manage a game lodge or a wildlife reserve in Kenya? Can you get me a job there? I said no. And, strange as it might seem, pitifully I don't own a single square inch of land in Kenya. Will you arrange my trip / book my flight / book my hotels / take me on safari? No / no / no / no. Kenyalogy is not a safari operator. I only give suggestions. I have to write an essay about lions for school. Will you do my homework? Nope, dude. And lucky you that I don't have your teacher's email. Hey! I have a travel site for the best deals on renting diving helmets in Timbuktu! Do we exchange links? Er... no, thanks. I only publish links that might be relevant to my visitors. 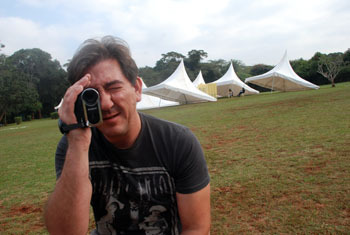 Be sure to check my Frequently Asked Questions (the non-weird ones) about travelling to Kenya. I'm sorry that it's not clickable and for the spaces in between. It's because of spam robots, you know.